Detailed are the internationally accepted standard S.A.E. taper dimensions. This standard is incorporated in the American Boat and Yacht Council (A.B.Y.C.) rules which are commonly used in Australia. All dimensions for S.A.E. taper standards are based on the SMALL end diameter of taper. 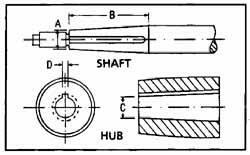 The reason for this is so propellers of different hub length (eg different diameters) fitted to the same shaft diameter, will have the nut face in the same position on the shaft.